Israeli state-owned defense contractor Israel Aerospace Industries Ltd. (IAI) and Israeli nonprofit SpaceIL presented a time capsule on Monday that will travel to the moon with the first Israeli spacecraft. The spacecraft, recently named Beresheet—Genesis in Hebrew—will launch alongside other satellites. If successful, the mission will make Israel one of the first ever countries to soft-land a spacecraft on the moon, following the former Soviet Union, the U.S., China, and possibly India. The time capsule consists of three discs, each containing hundreds of digital files. The files in the time capsule include details about the spacecraft and the crew building it, Israeli national symbols, including Israel’s Declaration of Independence and the Israeli flag, paintings by Israeli children, dictionaries in 27 languages, and information about Israeli scientific and technological advancements. SpaceIL was established in 2011 to compete in Google’s space race competition Lunar X Prize. The competition ended in January after no team was able to achieve the required goals within the time frame set. Last month, Jewish Canadian billionaire Sylvan Adams donated $5 million to SpaceIL. IAI is Israel’s largest aerospace and defense company. The company develops, manufactures and supplies defense systems including anti-missile, aerial systems, and intelligence and cybersecurity systems. 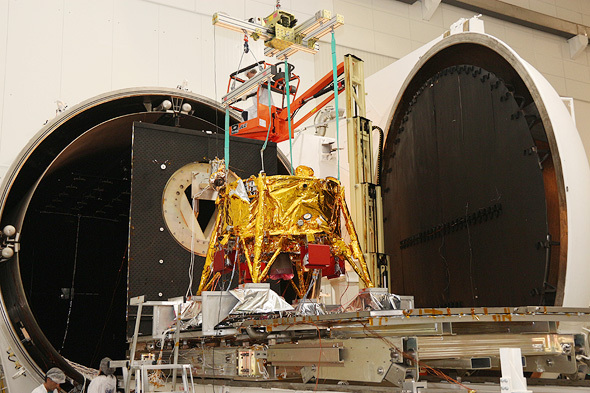 In October, SpaceIL and the Israeli Space Agency announced a collaboration with NASA that will enable them to improve their ability to track and communicate with the spacecraft before, during, and after the planned moon landing. The three entities also agreed that NASA will have access to data gathered by the magnetometer installed aboard the spacecraft.